If there is a type of hairstyle that is extensively known and utilized in Hollywood then that should be the Ombre' hair style. Generally, this type of hairstyle is frequently seen on celebrities on red carpet appearances. 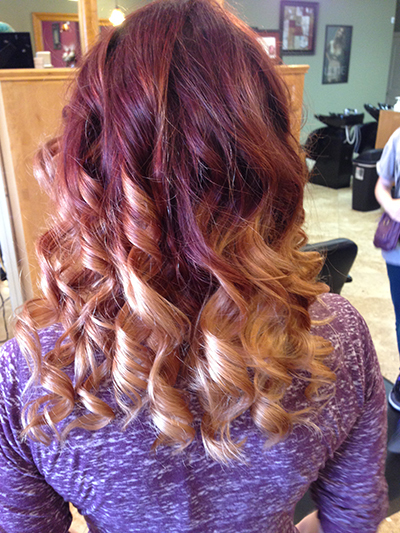 One of our latest services that we offer is women’s ombre’ color. This service is the easiest to maintain, but yet it is the trendiest look. Salon Zaina specializes in haircut and color. Get the best hair coloring and foil highlighting solutions at the most competitive rates. Our experienced hairstylists stay updated with the latest styles in hair cutting and hair color. We also specialize in special occasion makeovers. We are continually evolving to serve you better. Come and experience the relaxation as our as our staffs treats you with care. No matter you are a bride looking for the perfect style for the big day, or the latest hair, you will get epicurean pampering right from the moment you step into our salon. You will be warmly greeted and helped by a cordial receptionist who will be very felicitous to assist you get the professional that will suit your personal beauty requirements. Salon Zaina caters services by leading professionals and color specialists of the beauty industry. Select from an awesome range of services carried out by our knowledgeable certified stylists that will make sure that all your anticipations are met! Salon Zaina ensures you a caring, honest, educated and vibrant team that will improve your natural beauty through their top quality products and techniques. Fulfill your desire for the best and the most glamorous haircut and color you can think about at the best salon in Anna, Texas. We render a warm and enticing ambience with a personal touch that is simply unmatched. Our professional stylists are proud of their proficiency and knowledge of this business. We also bring to you top notch products at reasonable prices. Along with top class products and hair stylist professionals, our salon also has a stylish ambience which you will surely love. Our professionals offer complete value for money to all our customers. We take time to consult with every client in order to deliver precisely what they are looking for. We here at Salon Zaina strive hard to offer awesome salon care and ensure you will leave the salon feeling pampered.